The Dow fell 100 points as fresh evidence of the mounting financial crisis weighed on investor's minds. 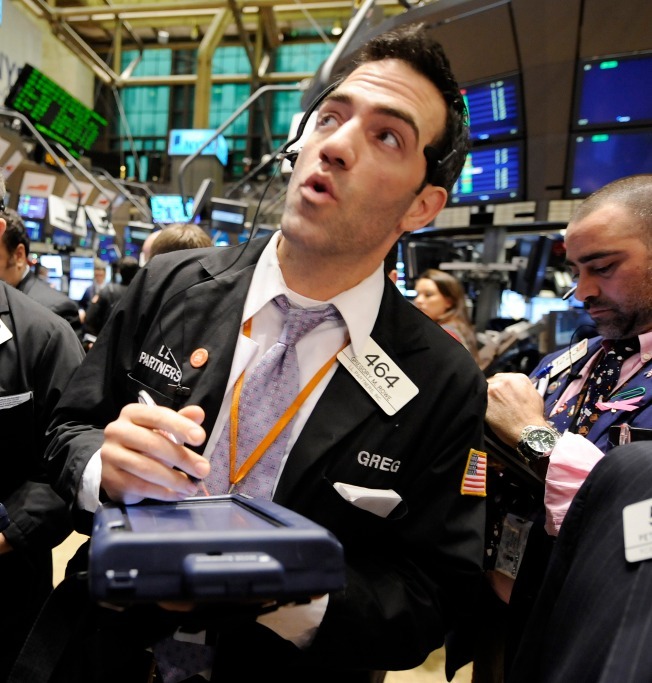 Wall Street finished moderately lower Wednesday, as further signs of economic deterioration dampened investors' earlier enthusiasm about the Federal Reserve's record interest rate cut. Stocks declined in the early going after a larger-than-expected loss from Morgan Stanley offered fresh evidence of the sizable obstacles the battered financial industry still faces. The company posted a loss of $2.37 billion, or $2.34 per share, for the fiscal fourth quarter. The report came a day after rival Goldman Sachs Group Inc. posted its first quarterly loss since going public in 1999. Some selling had been expected after Tuesday's huge rally in which the Dow Jones industrial average rose more than 4 percent and other indexes gained more than 5 percent. The moves came after the central bank lowered its federal funds rate target to a range of zero to 0.25 percent — the lowest levels on record. But after briefly moving into positive territory, stocks struggled to hold on to the big gains logged the day before as investors grappled with signs of a worsening economy, including more layoffs, and the magnitude of the Fed's actions. "This is a whole lot of new information for people to digest," said David Waddell, senior investment strategist and chief executive of Waddell & Associates. "Now we need time to sit back ... and figure out what it all means." Some investors also likely took the Fed's sharp rate cut as an indication of how dire the global financial crisis and economic troubles really are. The Fed's move was an unprecedented one aimed at boosting borrowing and lending. The central bank said Tuesday it anticipates the weak economy will keep the target rate low for "some time," and added that it is mulling the possibility of buying Treasurys — in effect, printing new money. Still, despite Wednesday's decline, investors have been rather resilient in recent trading sessions, an encouraging sign for analysts who believe the market might be entering a period of stability after the unrelenting selling of the past three months. "Even if the market is down 100 points, the fact that it's been in a narrow trading range I think is very positive," Waddell said. The Dow Jones industrial average fell 99.80, or 1.12 percent, to 8,824.34, after falling as many as 146 points earlier in the session. The Standard & Poor's 500 index slipped 8.76, or 0.96 percent, to 904.42, and the Nasdaq composite index fell 10.58, or 0.67 percent, to 1,579.31. The Fed's action on Tuesday is expected to lower rates on everything from home equity loans to credit card loans. Meanwhile, mortgage rates are falling after the Fed renewed its pledge to buy up billions of dollars of mortgage debt. The national average rate on a 30-year fixed rate mortgage on Wednesday was 5.06 percent, according to financial publisher HSH Associates, the lowest average since the early 1960s and down from 5.3 percent on Tuesday. Falling interest rates mean Americans could suddenly find billions of extra dollars in their pockets at a time when consumers have sharply cut back on spending amid rising unemployment and declining household wealth. But many experts believe that the interest rate cuts alone won't be enough to jump-start the economy. "It's a tall order to get (people) to go out and spend again," said Joseph LaVorgna, chief U.S. economist at Deutsche Bank. "That's why you also need a stimulus." President-elect Barack Obama's advisers are currently contemplating an economic recovery plan that could cost as much as $1 trillion over two years. Meanwhile, the fraud investigation of Wall Street money manager Bernard L. Madoff progressed Wednesday, as the Securities and Exchange Commission looked into the relationship between Madoff's niece and a former SEC attorney who reviewed Madoff's business. SEC Chairman Christopher Cox blamed regulators for a decade-long failure to investigate Madoff, who is accused of running a $50 billion Ponzi scheme. Cox said staff attorneys never bothered to seek a formal commission-approved investigation that would have forced Madoff to surrender vital information under subpoena. Bond prices extended sharp gains Wednesday. The yield on the benchmark 10-year Treasury note, which moves opposite its price, fell to 2.19 percent late Wednesday from 2.28 percent late Tuesday. The yield on the popular three-month T-bill — whose yield has at times gone negative due to frenzied buying — was at 0.01 percent late Wednesday, down from 0.03 percent late Tuesday. Overseas, Japan's Nikkei stock average rose 0.52 percent, while Hong Kong's Hang Seng index rose 2.18 percent. Britain's FTSE 100 rose 0.35 percent, Germany's DAX index fell 0.46 percent, and France's CAC-40 fell 0.30 percent.